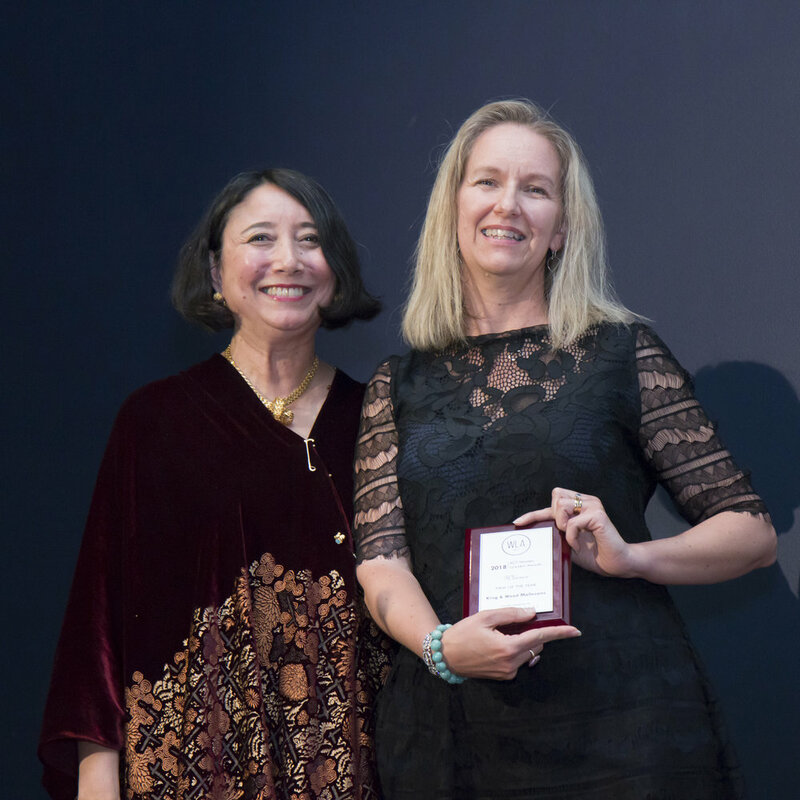 On 26 October 2018 WLA ACT hosted ACT Women Lawyers Awards at the National Gallery of Australia. We were fortunate to be joined by Tracey Spicer, who gave a humorous and inspiring speech. Congratulations to all our impressive award winners! While Carol Benda was only admitted to legal practice in 2016, her work in the women’s legal sector spans over 20 years. Carol has been a tireless advocate in relation to women’s legal issues and has the gift of translating that advocacy into tangible and significant outcomes. Carol has made a particular contribution in the area of access to justice for Aboriginal and Torres Strait Islander women through her work at both the Women’s Legal Centre and at Legal Aid ACT. Carol is often described as a force of nature. 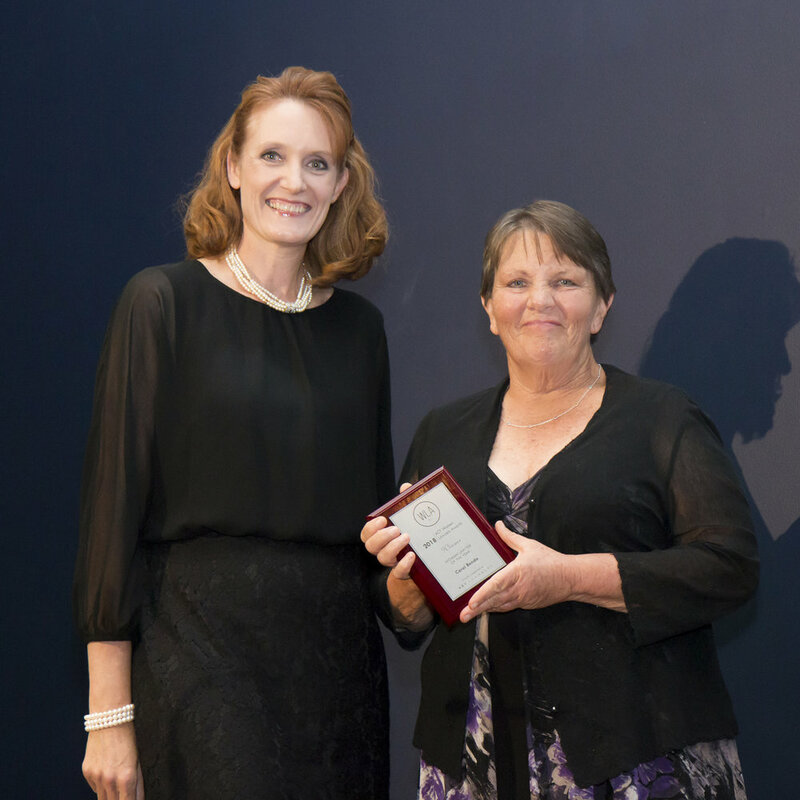 She has made an enormous contribution to the ACT legal community in a variety of roles over the years and epitomises in particular the unsung nature of work performed (mostly by women) in the community legal sector. She is a remarkable colleague and lawyer and truly well-deserving of this honour. Kristy studied at the University of Canberra. She joined ACT Government Solicitor, practising in the government law team. Her time working for government spawned a love of advising and representing government. Kristy was called to the Bar in 2012 at a time when female barrister in the ACT were rare. Kristy has built a successful practice doing what she loves, with a non-exclusive focus on government litigation. Kristy juggles the demands of family life and hopes that female practitioners do not see a move to the Bar as a bridge too far. Kristy is an outstanding barrister and possesses the two important characteristics for barristers: good judgement and courage. If you wanted to tell women about practice at the bar, there would be very few things about which one might speak, urge, or encourage, which could not be demonstrated by Kristy’s practice and career. Dr Suzanne Akila is a lawyer in the Transnational and Sea Law Branch of the Department of Foreign Affairs and Trade. She is a recognised international law expert, having completed her PhD on the international rules relating to the protection of nationals abroad, and practicing international law in both the Attorney- General’s Department and DFAT. Suzanne’s work has been published and she lectures and presents extensively on her area of expertise. Suzanne is recognised by her colleagues as a shining light of intelligence, strength and generosity. She brings an extraordinary level of intellectual energy to her work and her sound judgement delivers consistently high quality advice. Rebekha is a senior associate at King & Wood Mallesons. Rebekha is well regarded within her firm and has been identified as a unique individual firm, having also made an impact on the firm, clients and broader community. Rebekha is sought out by some of the firms’ largest clients, she has made an enormous contribution to the local community through her work as the Canberra coordinator of KWM’s Community Impact Program which delivers pro bono assistance, volunteering and staff and partner donations targeted in a way to the local community. Through every situation, Rebekha has always been highly enthiastic, a supportive approach and maintained a highly organised approach in her work. In the community space, Rebekha worked tirelessly to contribute her skills wherever needed. Rori is an in-house lawyer in the Corporate Law Branch of the Department of Foreign Affairs and Trade, providing legal advice on the department’s corporate functions, including on work health and safety, employment and general administrative law. Rorisang Moyo receiving her award from Liz Huang Hughes-Brown, winner of the 2016 CALD or Aboriginal and Torres Strait Islander Woman Lawyer of the Year Award. Before joining DFAT, Rori worked as an Associate in the Sydney Registry of the Federal Circuit Court. Rori was a volunteer of Marrickville Legal Centre and is currently Chair of the Policy Subcommittee of the Women Lawyers Association of the ACT. Roris is a tireless advocate for the interests of women lawyers and is admired by her colleagues for her deep subject matter knowledge, sound judgement and excellent relationships with her clients and colleagues alike. Outside of her significant work and WLA commitments Rori has also developed an innovative social enterprise ‘Textile Loop’ which aims to reduce textile waste by providing a better means of recycling and redistributing textile waste. Professor Lorana Bartels is a Professor of the University of Canberra, where she was Head of the School of Law and Justice from July 2016 to July 2018. Lorana is a member of various organisations including the ACT Law Reform Advisory Council; National Sentencing Network Leadership Committee; International Mainstreaming Therapeutic Jurisprudence Advisory Group; and editorial boards of the Alternative Law Journal, Criminal Law Journal and International Journal of Offender Therapy and Comparative Criminology. Lorana is an accomplished scholar and teacher who has made a significant contribution to the law. She goes out of her way to make dynamic connections with between her work in academia and the issues faced by practitioners at the coalface of the criminal justice system. Parastou is the Supervising Solicitor/Program Manager of Canberra Community Law’s Dhurrawang Aboriginal Human Rights Program. Parastou commenced legal practice at the Refugee Advice and Casework Service before joining Legal Aid NSW, where she ran two successful High Court challenges. Parastou has worked in Pakistan with UNIFEM and the Acid Survivors Foundation, and as human rightscampaigner and counsel for two agencies in Washington DC working with that city’s homeless population. Parastou is a highly intelligent and skilled lawyer and has demonstrated strong leadership in the ACT community. She is an inspirational feminist role model for women aspiring to a meaningful and impactful career in the law. Bridget is a solicitor in the Criminal Practice at Legal Aid ACT. She was admitted to practice in 2014. She has previously worked as a community educator for Australian Red Cross, as a specialist researcher on war crimes at the International Criminal Court, as Associate to the Chief Justice of the Supreme Court of Tasmania and to a Justice of the High Court of Australia. Bridget graduated from the University of Tasmania in 2011 with a Bachelor of Law and Bachelor of Arts with First Class Honours and received the University Medal for Law. Bridget has demonstrated a high level of skill in her chosen field of criminal law and has demonstrated courage in difficult advocacy situations. Bridget is a warm and inclusive lawyer who makes an effort to ensure her workplace is open to and inclusive of queer and gender diverse people. Liz is a Senior Government Lawyer of Safe Work Australia for two years. Liz has developed and led the Procurement function for the Agency, prepared drafting instructions for amendments to the model WHS laws and led a project team advising on the implications for the GIG Economy in the WHS space. Liz has shaped the sections’ profile as a trusted advisor to the Agency. She also co-chairs the Department of Jobs and Small Business Portfolio Agency’s gender equality network, and has contributed broadly to the Women Lawyers Association of the ACT. KWM is an international law firm with a thriving Canberra office. KWM offers a different perspective to commercial thinking and the client experience. With access to a global platform and a team of over 2000 lawyers in lawyers in 27 locations around the work KWM works with clients to help them understand local challenges, navigate through regional complexity, and to find commercial solutions, and is very much a reflection of them. While KWM values “legal excellence”, they also value our client service culture. Gender is one of the core priorities in KWM’s Diversity & Inclusion strategy and KWM recognises that diversity and inclusion are fundamental to its business success and to creating a great place to work. KWM is active on a range of fronts to promote gender equality, including: the 100 Days for Change Campaign, adopting an equitable briefing policy, a gender equality network, and gender targets for partnership. King & Wood Mallesons also achieved certification by the Workplace Gender Equality Agency (WGEA) once again in 2018 as an Employer of Choice for Gender Equality. Most notably KWM provides a comprehensive working parents support program delivered over four months. This was initially introduced as a working mothers program, but has expanded to include a working fathers program. This demonstrates KWM’s support for all working parents and helps to ensure everyone has the opportunity to parent and have a successful career.